Come and stay in our Beautiful, Fully Furnished Condominium overlooking the Beautiful Atlantic Ocean. Relax and Enjoy the very Private Balcony accessible from the bedroom and/or the living room. The ocean view can be enjoyed from the bedroom, living room, dinette, and kitchen. Plan your Summer Vacation or Spend the Winter at our very Comfortable Condo. This Condo has 900 square feet of living. That is more than some two bedroom units. The Bedroom has a King-size bed and there is a Queen-size sofa bed for any company you may have. This Condo is on the Top Floor, (5th Floor). Beautiful Tile Throughout. Child's Day Crib and High Chair are available for $25.00 per stay. Beach Chairs and Beach Towels are available for $25.00 per stay. In addition to the Full Bath there is a large Dressing Area that includes an Extra Sink. Plenty of Fresh Linens are included. This condo rental does not include daily maid service. Oceanfront Heated Pool (seasonally), Kiddie Pool, Oceanfront Deck, Lighted Tennis Court, Shuffleboard, Tropically Landscaped Courtyard, Clubhouse, and Picnic Gazebo. Fully Furnished and Equipped with Central Air Conditioning and Heat, Internet in the Condo, 2 Color TV's with Cable, VCR, DVD Player, and Local Phone Service. (Credit Cards or personal calling cards are required for long distance calls). Full Kitchen including Refrigerator with Ice Maker, Range, Dishwasher, Microwave, Small Appliances including Coffee Pot and Toaster. Coin Operated Washer and Dryer is conveniently located on the same floor just steps from the condo. Heated Pool plus a Kiddie Pool, Lighted Tennis Court, Shuffleboard, and Clubhouse. The Beach and Ocean offers Walking, Biking, Surf Fishing, Sunning, Boating, Sailing, Water skiing, Surfing, Jet Skiing and Shelling. This condo is conveniently located within walking distance to shopping and restaurants, and a gym. The area has nearby Golf Courses, YMCA, Amusements Parks, Shopping, Horseback Riding, Live Theater, Cinemas and Lots more. I personally own and manage this condo. This condo is located in a quiet area of the building on the top (fifth) floor. It is direct oceanfront and has a private balcony. Right across the street from a shopping center that has a food store, restaurant, bar and Nautilus Center. This condo is direct oceanfront, with unobstructed views. 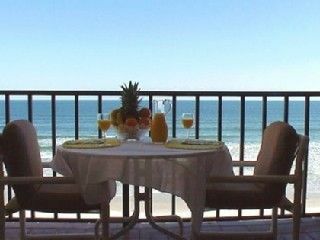 The location was great with a nice balcony overlooking the beach, our top priority. Great location, nice beachside pool, beautifully maintained grounds, beautiful ocean view from the balcony. Comfortable bed. Bathrooms need updating.